UPDATE: Due to me assigning too many violent movies in a short period of time, I'm pushing Apocalypse Now to a later date. We'll be discussing Man on Wire on Feb 23rd instead. I know we haven't had our Fight Club discussion yet (which if you're free tomorrow you should join! ), but I wanted to announce what films we'll be discussing next. I was lame and had to postpone the Fight Club discussion, so I need to make sure you have enough time to start watching these movies! I'm really excited about February because a) this means that we're into our second month of doing these (whoo!) and b) we're watching several films from the same director. 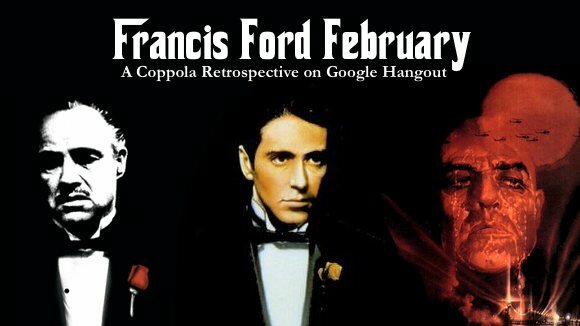 I'm calling it "Francis Ford February: A Coppola Retrospective." I'm hoping that by watching them in quick succession we will be able to draw some cool parallels and connections, and maybe start to grasp Coppola's filmmaking style. These aren't all of his films, but it's a great starting point. I also have some ideas for similar retrospectives with other directors, and I want to experiment a little. I'm testing both how a discussion on multiple films goes (i.e. The Godfather movies) as well as how the discussions work within a larger picture based on a theme or filmmaker (in this case the director). Be sure to RSVP to each event, hopefully you can make both! Based on feedback from some of you, I think we're going to stick with the Saturday morning time, but let me know if another time works better for you by filling out this form. Again the basics are that Google Hangouts can only hold ten people at a time, so the first ten to RSVP will get in and I’ll make sure to broadcast the discussion so the rest can watch and comment live as we go.